Wow!! Where has all the time flown. I really wish things weren’t so busy that I had more time to blog. Well, I’m definitely a few weeks behind, but luckily I can still recount weeks eighteen and nineteen. As eighteen is my favorite number is was a great week all around. School was great, as usual, and I even had a day off!! The nice part about being a sub is that if the kids don’t have school, I don’t have to be there either. 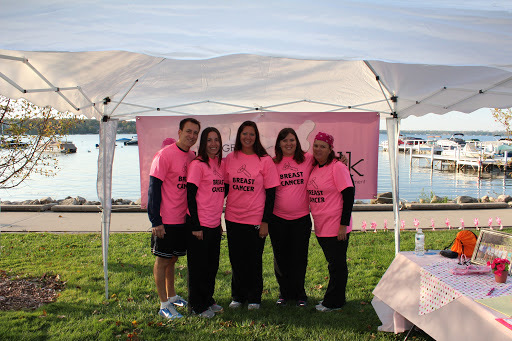 Week eighteen also brought the Hope Walk in Lake Geneva. There was only five of us this year, but we definitely had a great time. The weather was perfect. It was my first year doing the “shortest” version, but in the end I was okay with that. At about mile three, I started to “feel it” in my back. Lindsey and Mike were the only ones to walk the full fourteen miles. While they were walking, mom, Traci and I were tackling Target. Pretty sure Traci has never experienced a trip to target like that before!! As with tradition we went for lunch at Sprecher after the walk. The rest of the weekend was good from what I remember of it. I went to soccer for the boys and then over to Matt and Kelly’s for a nice bonefire at night. Week nineteen was a whole new experience in itself!! I hate the number nineteen, so I was hoping that it would get done as soon as possible. Seeing as I’m superstitious with numbers I was quite nervous when I started having this awful pain in my belly and pelvis. After much “Google” search (what people did before Google is beyond me) and talking to some friends, I learned it was my first experience with Braxton Hicks. It made sense seeing as I had the walk a few days before and had taken a small stumble during the walk. Needless to say it was a painful experience, but now I know what to expect. At school during week nineteen, it was Homecoming Week. I’ve always been a HUGE fan of school spirit, hence the reason student council was my life in high school, so I was definitely looking forward to my first homecoming as a teacher. The weirdest part to me about homecoming week was that I actually felt like a traitor getting into the school spirit of Muskego. They were a rival of ours in high school and I specifically remember one year when I wanted to get a red and black dress for a dance and someone was like those are Muskego colors! Needless to say, I didn‘t get that dress. Well, for homecoming, Muskego definitely goes all out. The week before every student received a bound program stating the following weeks activities. Everyday there was something besides the usual spirit day. One day there was hallway decorating. Each grade level was given a theme and had to decorate every inch of the hallway. It was probably the coolest thing I have ever seen. There was also window decorating at the local businesses, sport/club banners and games in the cafeteria daily. The students really got into it. The spirit days were super fun as well. On Monday it was multiplicity day (a twist on the normal twin day). Groups of students dressed up from the alphabet to super heroes. Staff wore jeans and their Packer jerseys (clearly jeans on a Monday was my favorite part). On Tuesday it was decade day. Again, the outfits were awesome. Wednesday was generation gap day and it was by far my favorite day of the week. Freshman were to dress as babies, sophomores as toddlers, juniors as adults, seniors as the elderly and staff as teenagers. I have never seen so much creativity with dressing up. Boys were dressed as old ladies, the freshman and ssophomore classes bought stock in footie pajamas and where all the kids got walkers and canes is beyond me. Thursday, was color day. Each class has a color (freshman yellow, sophomores green, juniors purple and seniors blue). Finally, Friday was warrior day with a pep assembly at the end of the day. All in all, I had so much fun dressing up and watching the kids enjoy their school spirit. I have truly never seen so much school spirit in my life and it made me smile knowing that the kids enjoyed the week so much. I often referred it it as organized chaos for the week. 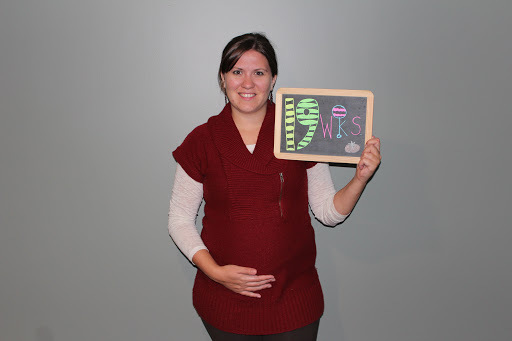 How Far Along: Almost 22 weeks!! Best Moment of the Week: Watching all the kids dress up for homecoming. It was so much fun to witness as a teacher. Movement: It’s here!! Not too strong and Ben still can’t feel, but more and more is happening. Happy or Moody: Super happy, but very sleepy!! Looking Forward Too: Our gender reveal!!!!!! !